Reviewed this movie in the message board, but I wanted to post something about it here as well. "I reject that whole point of view - that animation is a children's medium. The way people talk about it is, well, hey, it's a good thing I have kids, because now I get to see this. Well, hey, no, man! You can just go and see it. There's no other art form that is defined in such a narrow way. It's narrowminded, and I can't wait for it to die." 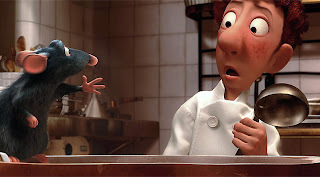 "I think all movies are an illusion, whether they are live action or animation. And I think the best special effect that people don't pay enough attention to is caring about the characters who are going through the set pieces. If you can be invested in the characters that you are putting in danger, then you can amp up the pressure, and it really means something because people are rooting for them to survive. Characters are the special effect." This is important for us as filmmakers to remember, because - like it or not - on the level of filmmaking we're doing in this town, more people than I'd like to name here tend to focus on the things they're good at: make up, special effects, sound, camera geekery, etc., and what I find lacking in their films is the aspect of character and good writing. 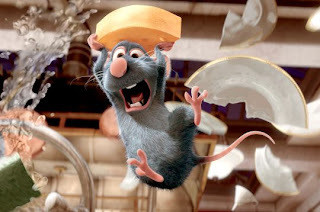 In any event, Ratatouille can serve us filmmakers in many aspects: as entertainment, certainly, but also as a 90 minute film-school on how to develop character and how to write a good film.